“Hand hygiene seems so simple but is complex in health professionals minds otherwise it would be done all the time. Having hand washing ‘handy or in close proximity’ to the work seems to be one key. We need dispensers on all medication and treatment carts as well as all other trays or patient care areas. Then the real effects of hand washing and hygiene can be felt with reduced illness and infection among patients as well as care givers” commented Gayle Burrows, an experienced correctional nurse administrator, on the previous post. Her observation echoes recommendations from the Institute for Healthcare Improvement that hand hygiene of healthcare workers improves greatly when the following “best practices” are in place at the worksite. Before and after direct contact with patients. Before and after invasive procedures. After contact with body fluids or excretions, mucous membranes, non-intact skin, and wound dressings if hands are not visibly soiled. When hands are visibly dirty or soiled with blood or other body fluids. When caring for patients with diarrhea like illnesses. Perform hand hygiene immediately after gloves are removed. Change gloves when moving from a contaminated site to a clean site on the same patient. Change gloves after caring for each patient. Use an alcohol-based hand hygiene product (rub, gel, or foam). Antimicrobial-impregnated wipes (i.e., towelettes) are not a substitute for using an alcohol-based hand rub or antimicrobial soap. Rub until dry (at least 15 seconds). Wash hands with soap and water, including contact with soap for at least 15 seconds. Cover all surfaces including palm, back of hand, fingers, fingertips, and fingernails. Use paper towel to turn off the faucet. Dry hands with fresh paper towel. Take gloves off inside out so the hands are not in contact with a contaminated glove surface. 3. Hand hygiene supplies are available at the point of care. Availability of alcohol-based hand rub at the point of care minimizes the time constraint associated with hand hygiene during patient care and is a predictor of better compliance. The cost of hand hygiene products should not be the primary factor influencing product selection. Hand-hygiene products should have low potential for irritation. Provide hand lotions or creams to minimize the occurrence of irritant contact dermatitis associated with hand antisepsis or hand washing. Availability of gloves in appropriate sizes at the point of care for use in high-risk situations when barrier technique is indicated. Sterile gloves are not required for this purpose. Here are the answers to the questions about hand hygiene that were posted last week. Did you use any of these as a test of knowledge for yourself or among your co-workers? How did you do? Please share your experiences improving hand hygiene by responding in the comments section of this post. 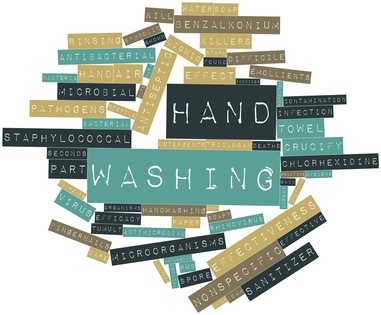 ← What is Your Hand Hygiene IQ?